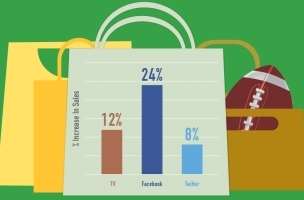 INFOGRAPHIC: Super Bowl TV Ads Get The Glory, But Is Facebook A Better Buy? It sometimes seems as if Super Bowl ads draw more attention than the big game itself, but Ampush, a Facebook Strategic Preferred Marketing Developer, shared some statistics which show that advertising on the social network may actually be more beneficial to brands than shelling out some $4 million for 30-second spots during the telecast. Facebook boasts the largest national audience, with 198 million monthly active users in the U.S., followed by the 108 million people projected to watch the Super Bowl in the U.S., and Twitter’s 49 million monthly U.S. users. Facebook blows away TV in terms of ad targeting, with a 90 percent accuracy rate, compared with 38 percent for the small screen. Campaigns on Facebook drive more sales than campaigns on TV and Twitter combined. More time is now spent on digital media than watching TV. The $4 million cost of a Super Bowl ad could drive 6.8 billion Facebook impressions. Readers: Will you interact on Facebook during Super Bowl XLVIII?